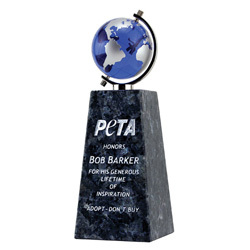 Rock solid global achievement should be ultimately recognized with a stunning, masterful award. For your most important presentation, select the Galileo Globe Award to honor and recognize those special individual's that have made a world of difference to your organization's overall success. Beautiful Norwegian Blue Pearl granite is the solid anchor for Quarry's spinning blue with silver optic crystal world globe.